A Kittery Community Center bus carrying 11 children and two staff members was involved in a single-vehicle accident on Interstate 95 Friday morning, with first responders from multiple towns responding to the crash. GREENLAND, New Hampshire — A Kittery Community Center bus carrying 11 children and two staff members was involved in a single-vehicle accident on Interstate 95 Friday morning, with emergency crews from multiple towns responding to the crash. Kittery Town Manager Kendra Amaral said all injuries caused by the crash were non-life threatening. The crash was reported on the southbound side of the interstate highway at 9:20 a.m., and police and firefighters were called from around the area to assist. State police took command of the scene, where Portsmouth, Exeter and Greenland responders assisted. Traffic was backed up on the interstate to the Maine state line. State police Lt. John Hennessy said it appeared the vehicle left the roadway because the driver suffered a possible medical event. The driver, an 18-year-old camp counselor, and a 10-year-old child were all transported to Portsmouth Regional Hospital with injuries initially reported as “serious,” but Hennessy said “that is changing as we speak,” indicating the injuries are non-life threatening. The remaining children and one counselor were transported to Exeter Hospital for either unknown injuries or precautionary measures, he said. Portsmouth Fire Lt. Brian Ryll said firefighters from his department transported seven of the patients. Initially, he said one of the injured was an adult with “severe” injuries, three patients had moderate injuries and the rest were considered minor. 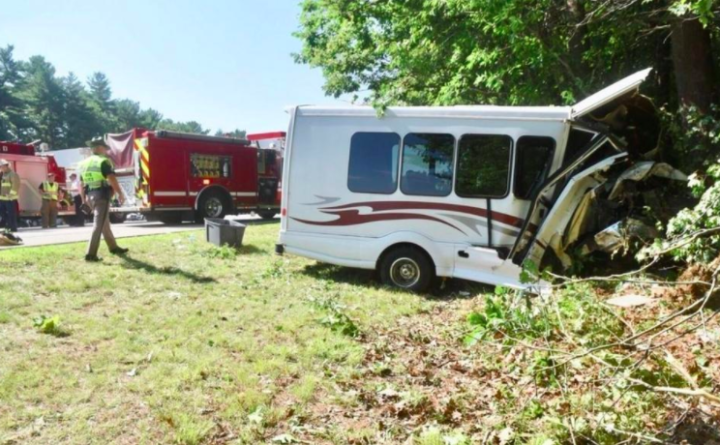 Amaral said the accident involved the Kittery Community Center’s SAFE program van, which was headed to a day trip at Candia Springs Adventure Park. She said the town is in the process of contacting parents of all children involved in the accident. She noted the van was following another bus that was carrying the rest of the program’s children; that bus made it safely to Candia. “We are truly grateful to the bystanders who stopped to help, the first responders who ensured that the participants of the program were safe and taken care of and getting them to the hospital,” Amaral said. Amaral could not comment further on the bus driver’s condition, but confirmed he or she is a Kittery Community Center-employed driver. By 9:59 a.m., all patients were transported to Portsmouth Regional and Exeter hospitals, according to responders. By 10:30 a.m., all but the right travel lane were reopened. The cause of the accident is currently under investigation by the New Hampshire state police.